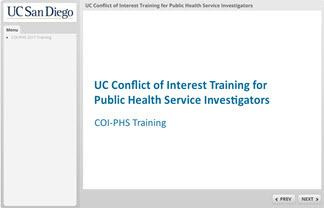 UC Conflict of Interest training for public health service investigators (non UC San Diego Employees). By the end of this online class, participants will be able to describe the basic fundamentals of the conflict of interest disclosure requirements for federal PHS sponsored research. Follow the directions provided on the last slide of the course to submit confirmation of completion to the COI Office.